Guaranteed good! Sweet potatoes are everywhere this time of year. And they are as easy to use successfully as they are to find. 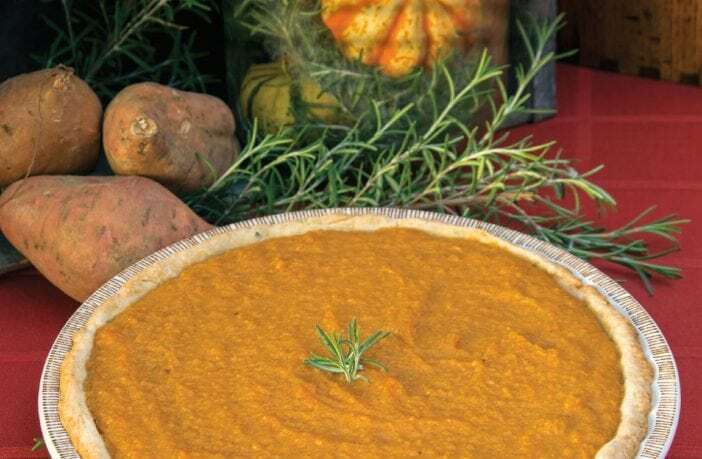 Wildly nutritious but also sweet, there’s just no way to lose by using sweet potatoes throughout your holiday menus. Preheat the oven to 375 degrees. Grease muffin cups or fill with papers and set aside. In a small bowl, combine the flour, sugar and 2 teaspoons of the cinnamon. In a mixing bowl, whisk together the egg, sweet potatoes and oil. Add the flour mixture and stir just until moistened. Evenly divide among the muffin cups, filling two-thirds full. Bake 15-18 minutes or until a tester inserted in the center comes out clean. Meanwhile, whisk together the powdered sugar, milk, melted butter, extract and the remaining cinnamon. Cool the muffins 5 minutes, then remove and transfer to wire racks. Drizzle the glaze over warm muffins. Preheat the oven to 425 degrees. With a mortar and pestle, coarsely grind the coriander, fennel, oregano and red pepper. Add the salt and mix well. Lightly grease a jellyroll pan with cooking spray and toss the sweet potato wedges with oil. Sprinkle with spice mixture and spread in a single layer in the pan. Roast for 20 minutes, then turn and roast 15-20 minutes longer. Serve warm. Place the potatoes in a large saucepan and cover with water. Place over medium-high heat and bring to a boil. Cook 25 minutes or until the potatoes are soft. Drain and transfer to the bowl of an electric mixer. Beat until smooth, transfer to a shallow bowl and set aside to cool. Meanwhile, preheat the oven to 350 degrees. Grease and flour three 9-inch cake pans. In a mixing bowl, stir together the cracker crumbs, 1 cup of the pecans and ¾ cup of the butter. Evenly divide among the cake pans and press into the bottom. Set aside. In a medium bowl, combine the flour, baking soda, baking powder, allspice, cinnamon, nutmeg and salt. In the bowl of an electric mixer with the whisk attachment, beat 1 cup of the butter and the granulated sugar. Add the eggs one at a time, beating well after each addition. Stir in 1 teaspoon of the extract. Alternately add the flour mixture and the sweet pota-toes until well combined. Evenly divide among the cake pans and pour over the cracker mixture. Bake 28-30 minutes or until a tester inserted in the center comes out clean. Cool on a wire rack 10 minutes, then remove and cool completely. In the bowl of an electric mixer, combine the cream cheese, remaining butter, remaining extract and powdered sugar. Beat until smooth and spread between layers of the cooled cake. Garnish with the remaining pecans. Preheat the oven to 375 degrees. In a large bowl, stir together the flour, cornmeal, powdered sugar and rosemary. With a pastry cutter or two forks, cut in the cold butter until crumbly. Add the cold water a tablespoon at a time until the dough comes together and is moist. Place on a well-floured surface and knead for 8 minutes or until the dough does not feel sticky. Roll the dough into a 10-inch circle and place in an ungreased 9-inch pie plate. Set aside. In a mixing bowl, stir together the sweet potatoes, granulated sugar, melted butter, condensed milk, extract, allspice and cinnamon. Transfer to the pie crust and bake 25-30 minutes or until firm. Place on a wire rack to cool completely before slicing. 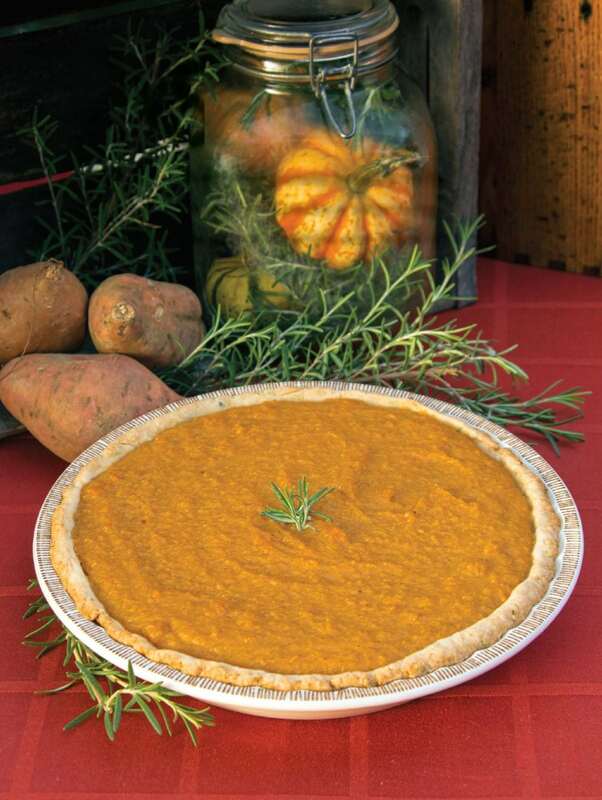 Prepare the crust as instructed for a single-crust filled pie and set aside. In a small saucepan over mediumlow heat, combine the milk, brown sugar and cream cheese. Cook, stirring frequently, until smooth. Transfer to a mixing bowl and allow to cool 5 minutes. Whisk in the sweet potatoes, eggs, juice, extract, salt and cinnamon. Pour into the prepared crust and bake at 350 degrees 50-60 minutes or until a knife inserted in the center comes out clean. If needed, cover the edges with foil during the last 15 minutes of baking to prevent overbrowning. Meanwhile, beat the egg whites and cream of tartar in the bowl of an electric mixer on medium speed until soft peaks form. Gradually add the sugar, 1 tablespoon at a time, and increase the mixer speed to high. With a wooden spoon, fold in the marshmallow cream. Spread evenly over the hot filling, sealing the edges to the crust. Bake 12 minutes longer or until the top is golden-brown. Cool on a wire rack 1 hour then refrigerate 3 hours before serving. Add the potatoes and parsnips to a large pot of boiling, salted water. Boil gently uncovered for 12 minutes. Drain and transfer to a food processor. Add the butter and puree until smooth. Add the milk, sugar, salt and pepper and process until well blended. Serve warm. Melt butter in a nonstick skillet over medium-high heat. Place shredded sweet potatoes and onions in the pan; cover and cook, stirring occasionally, until sweet potatoes are tender, about 10 minutes. Stir in the chili powder, garlic powder and sugar. Cook, uncovered, until potatoes are golden-brown on the bot-tom, about 5 minutes. Turn and allow the potatoes to brown on the other side. Serve warm.